Hoaxes have played a role throughout American history, from P.T. Barnum’s “humbug” to the current assertions from Donald J. Trump about “fake news.” In his book, Bunk, Kevin Young traces this history and its focus on racist stereotypes and suspicions. 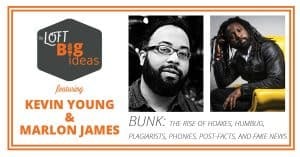 In this installment of Big Ideas, Kevin Young joined in conversation with Marlon James and discussed how reality has been distorted and manipulated throughout American history. Advanced tickets guaranteed a general admission seat and help cover the Loft’s costs to host the event. Advanced tickets were non-refundable. Pay-what-you-can tickets were available at the door 30 minutes prior to the event on a first-come, first-served basis. No one was turned away for lack of funds. Doors opened 30 minutes before the event. Seating was not assigned. Big Ideas is a series from the Loft that puts literature at the center of dynamic conversations and brings together readers and writers to explore ideas relevant to our society today. For more photos, click here. 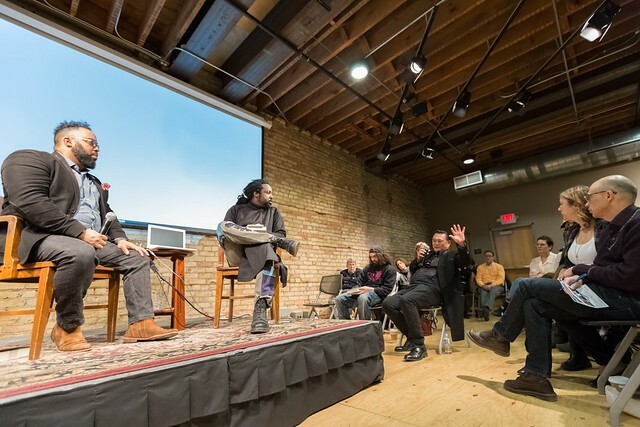 This event was presented in collaboration with the College of Saint Benedict and Graywolf Press. Support came from PEN America’s Press Freedom Incentive Fund, a resource for mobilizing communities around information access, media truth, news literacy, and other issues related to press freedom advocacy.